Earlier this week I tried importing a Local IIS website in Visual Studio 2005 on my new Windows Vista PC. "Unable to access IIS metabase. You do not have sufficient privilege to access IIS web sites on your machine." A quick search on Google revealed the above error is in relation to not having the Virtual Directory set up as an application, as the error states. However, my Virtual directories were fine, infact IIS was already serving a previous build of the website. Further digging revealed that the solution was to do with the way Visual Studio 2005 interacts with IIS. 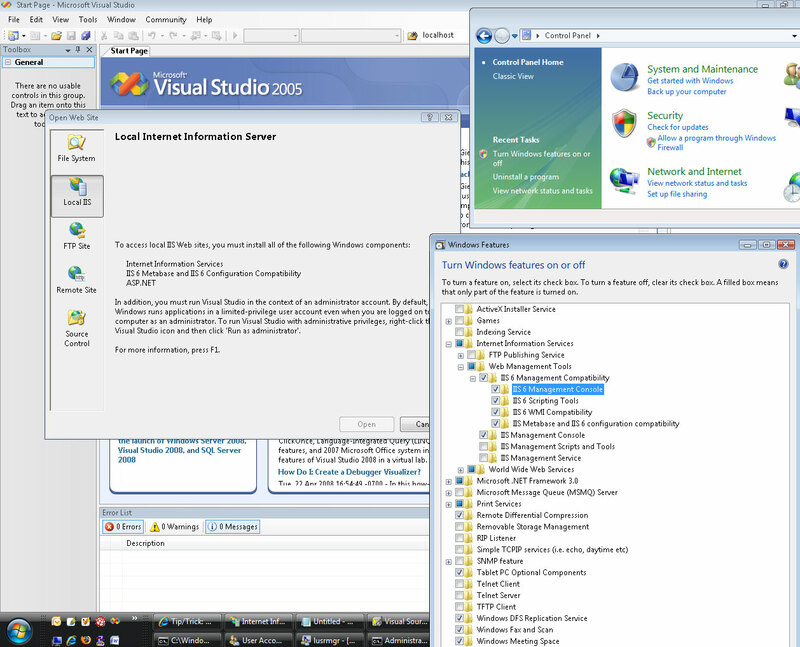 In order to allow Visual Studio to have access to IIS 7.0, you have to enable an IIS 6.0 Compatability Mode in Vista. In the bottom left margin, click "Turn Windows features on or off"
I then installed .Net Framework 3.5, which includes updates for Framework 1.1 and Framework 2.0 in Vista. I clicked "Open Website" then the "Source Control" tab. I opened the relevant project from Visual Source Safe, then clicked the "Run as IIS Web site" option. All is now fine and dandy!